Or the body. Wait, what? Lather the body. Not lube. Freudian slip. So the wordsmith’s well has run dry? 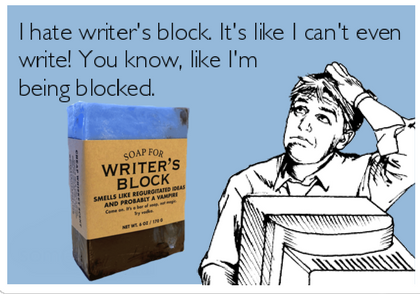 Try this specially-crafted Writer’s Block soap. 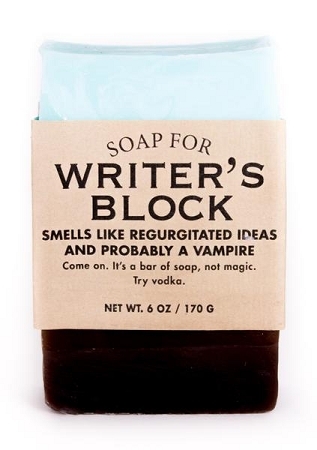 If this soap doesn’t help you churn out regurgitated ideas and probably a vampire, I’ll eat my hat. It’s a fedora, by the way. Cool vampires wear fedoras now. Put that in your crack pipe and smoke it. Or in your book. Either way, you’re gonna need this soap ASAP. Your ideas are terrible.